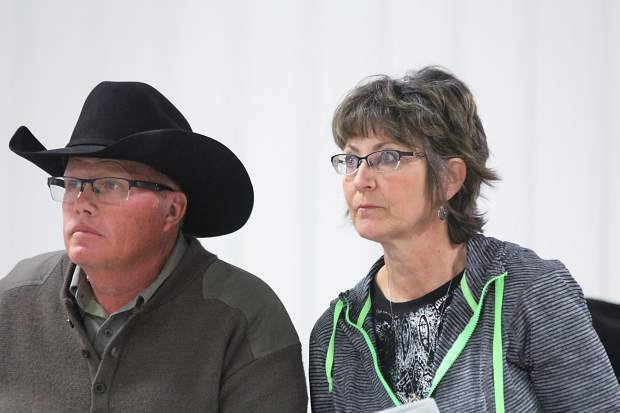 Cover Ranches, Hyannis, Nebraska, repeat Barstow Angus bull buyers. 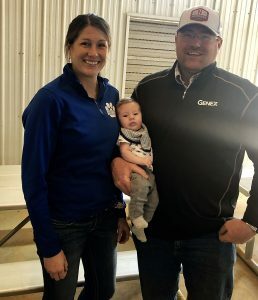 Barstow Angus, Neri and Patty and family held a very successful sale in their new sale facility at the ranch near Springview, NE on Mar. 14. 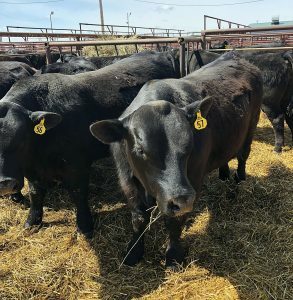 This was the 25th Anniversary sale for Barstow Angus. 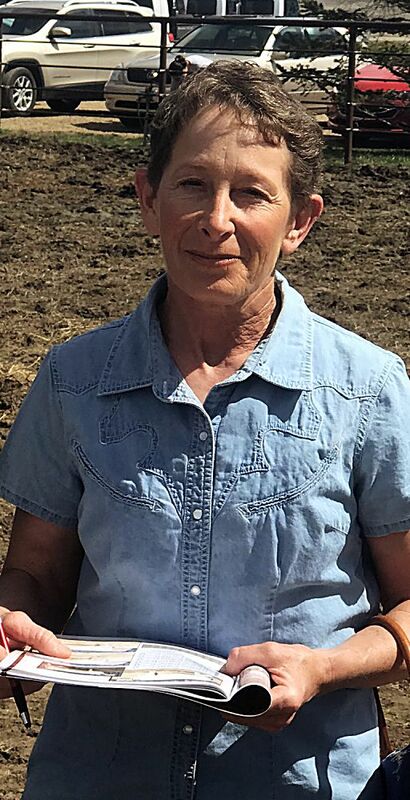 With all the changes in the beef industry and ranching, the Barstows have kept dedicated to the ranching legacy and producing high quality Angus seed stock for their customers. Their word is their bond, which is evident by the large crowd of repeat buyers in the seats every year. Barstow Angus is the breeder of Barstow Cash, one of the leading AI sires of the Angus breed. 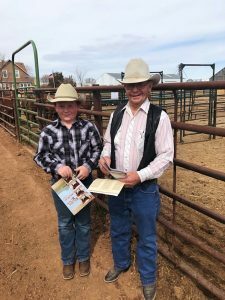 The 20 Cash sons and grandsons averaged over $7,500 on the day. All the sale bulls had been fed in a large hillside lot ensuring plenty of exercise for soundness and hardness. As a sale feature, this year Neri and Patty offered the pick of the herd from their replacement heifers. The winning bidder got to take their pick out of the replacement pen that Barstow’s are keeping to continue the herd. 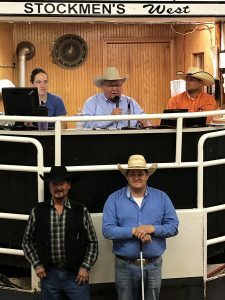 Krebs Ranch, Gordon, Nebraska, was the winning bidder at $8,000. Topping the bulls was lot 7, Barstow Cash C50, a Jan. 2015 calving ease son of Barstow Cash that had a 650 pound weaning wt., 1,385 pound yearling wt. and epds of CED 9 BW –0.1 WW 56 YW 110 Milk 17 $B 135.57. Lee Cattle Co., Brush, CO was the buyer at $20,250. Lot 1, Barstow Cash C6, another Jan. 2015 calving ease Cash son sold to Straka Angus, Stuart, NE for $17,000. This bull had a weaning wt. of 716 pounds, yearling wt. of 1366 pounds and epds of CED 13 BW 0.2 WW 61 YW 110 Milk 22 $B 143.52. Lot 86, Barstow Black Granite C76, a Jan. 2015 son of Connealy Black Granite with epds of CED 16 BW -2.5 WW 61 YW 100 Milk 26 sold to ABS Global, Deforest Wisconsin, for $15,000. Lot 61, Barstow Unanimous C55, a Jan. 2016 son of Vision Unanimous sold to Ponca Creek Cattle, Bonesteel, South Dakota, for $12,500. This bull had a weaning wt. of 727 pounds, yearling wt. of 1365 pounds and epds of CED 2 BW 1.8 WW 61 YW 108 Milk 25. Straka Angus struck again on lot 21, Barstow Impressive C16, a Jan. 2015 son of Mohnen Impressive with epds of CED 12 BW -1.9 WW 58 YW 106 Milk 25. Lot 43, Barstow Rocky C207, a Mar. 2015 son of WK Rocky with epds of CED -10 BW 3.2 WW 66 YW 120 Milk 32 sold to Chad Ludeman, Springview, Nebraska, for $11,750. This power bull had a 205-day wt. of 826 pound and 365 day wt. of 1530.